Langford Firm on Forest Fire Frontlines - FTS Inc.
Have you ever noticed the signs outside of fire halls and along highways that rate the current fire conditions? A Langford company is responsible for the technology that determines those ratings and has been helping fire crews for more than 30 years. “In North America we are fire, we are the guys,” said Alan DeCiantis, Director of Product Management at Forest Technology Systems Ltd. (FTS). FTS manufactures remote environmental monitoring systems, instrumentation, and communications technology. Their fire weather stations, also known as remote automated weather stations, collect data that is then decoded and used by agencies across North America and the world to calculate the national fire danger rating system or that area’s equivalent rating system. FTS stations are used by the top 50 government forest management agencies across Canada and the United States. 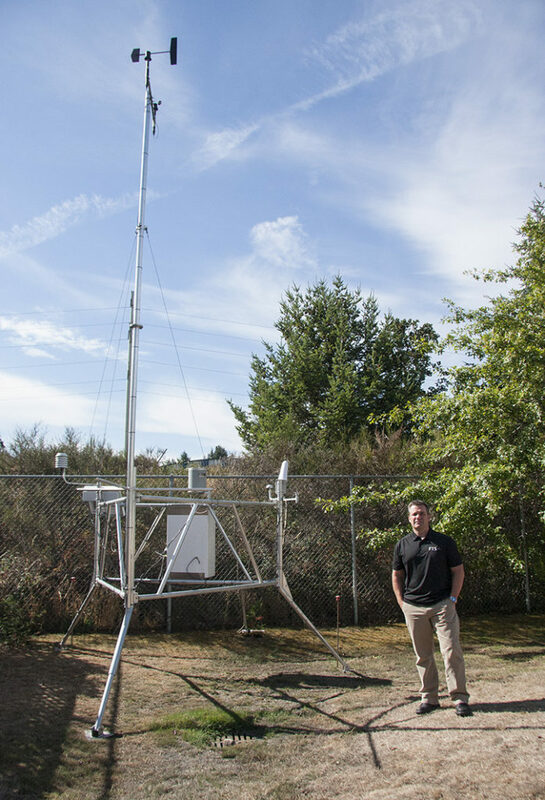 In terms of fire weather stations, “we cover all of Canada,” said DeCiantis, adding that about 90 per cent of fire weather stations in the United States use FTS products. These weather stations measure everything from solar radiation, fuel temperature and wind to rainfall. Results are then transmitted, usually via satellite, and decoded by a preset algorithm to essentially predict where a fire is going to start. While the public sees the results of this data in the form of signs and fire bans, agencies have another use for the data. “What it’s really all about and what these guys really do is they use the data to coordinate their suppression activities,” said DeCiantis. It is difficult for crews to be in all of the different areas that are burning with active wildfires at once, but data from the stations helps crews coordinate their efforts and determine where best to send resources. Other factors, such as population density, can also effect where those resources are delegated. DeCiantis said they usually keep some surplus equipment on site for programs that require equipment to be swapped, but recently customers have been asking for everything they can get their hands on. “It’s pretty extreme right now,” he said, about this fire season being one of the direst on record this decade. Besides the weather stations, FTS also has a portable model. The FTS quick deploy portable weather station is like the “little brother” to the bigger unit and is used by crews on the ground. It breaks down into two soft cases that weigh between 50 and 75 pounds and can easily be loaded on the back of an ATV or a helicopter and taken into remote areas. The device can also be assembled by one person in about 15 minutes with no tools. While the bigger units help predict outbreak and suppression, the portable units measure a microclimate near a fire line and are particularly useful to measure things like wind speed and direction, DeCiantis said. This can be used to predict the behaviour of a fire. The stations are equipped with a radio system that broadcasts any changes to crew members in the area so they can continue to actively monitor the situation. To make sure these crews and agencies are getting the most reliable and accurate data, these stations are built to last unattended in some of the harshest terrain in North America. DeCiantis said their remote stations have withstood everything from wildfires — one unit was burnt but continued to transmit data even after the loss of a few sensors — to being attacked by wild animals. In one incident, a bear decided it did not like one of their stations and severed the solar panel from the unit. That station continued to transmit for almost nine months using only its battery power. That’s why the units are built to not only withstand the vast and harsh climates but also have armoured cables to keep animals from chewing through them. The devices can also withstand wind gusts as high as 160 km/h. DeCiantis said that durability has allowed many devices to last more than 10 years, some as long as 20. While FTS does the majority of its support and other work in Langford, it also has a small logistical office in Blaine, Washington. Of the roughly 60 employees, about 55 work in the West Shore, where employees receive weekly yoga sessions, monthly barbecues, a gaming system in the break area and other perks for their hard work. “We try to move fast and stay agile but we mostly try to keep that close-knit, small company feel,” DeCiantis said.